What’s it like? This little oasis of calm in the hub of Bandra is well worth a visit for the open grassy areas and the winding paths perfect for a charming walk. Frankly it’s so lovely if you look at the pretty, petit park strewn with picnickers, families and the rest. 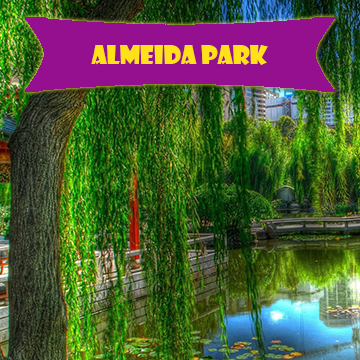 Carefully maintained and lovingly cared for, this park is popular with kids and adults alike. Sit down in the pleasant shaded areas overlooking the children’s play area which is conveniently located amidst the busy walking zones. Transport: Public access is very easy by bus, car or foot. Did you know? The park has been named after Prof. Raphael Almeida – ex-Mayor; Municipal Councillor, Senator, Hon. Magistrate and a renowned botanist who dedicated his life for the betterment of Bandra and its youth. People’s appreciation of parks is enriched through effective interpretation of parks and their resources. Things have changed over the decades, but going to a park with the family and friends or even alone is timeless.